Here at astrobites, our primary goal is to get to the heart of one article each day and compress it into a passage that is readable in 5 minutes or so. Speaking for myself, the ability to do this with journal articles, especially on topics I am less familiar with, is a challenge and a skill worth developing. From the perspective of the paper’s author, an article must appeal to the experts in the field who will be reviewing their work. Some authors are skilled writers and can find ways to elegantly explain their findings while shying away from a large amount of subfield jargon. However, while writing is a major part of this profession, many papers are written only with readers who are world experts in mind, making journal articles difficult to approach for the casual reader. So, you are ready to go beyond our “bites” and dig into the real articles in all their raw glory. Where to begin? 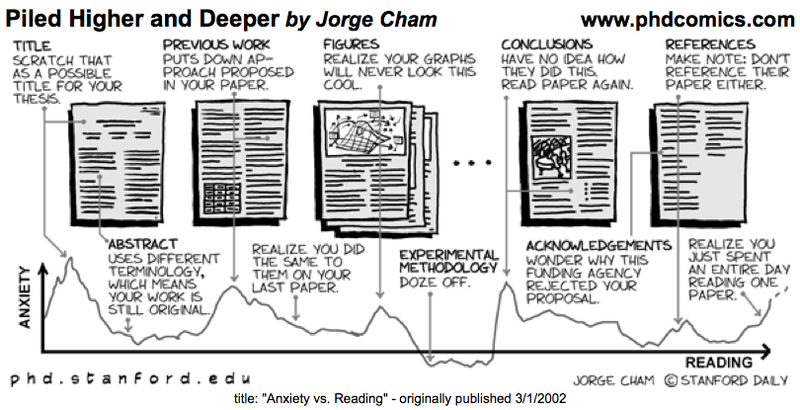 Giving advice on how to approach journal articles is something like telling someone how to study for a test. There is just no “right” way to do it. Everyone develops a way that works for them. Certainly, understanding a new article published by a group in your research field requires a different level of commitment than reading new articles that appear interesting on arxiv. So instead of describing the “best way to read a paper”, I will discuss how I more casually approach an article I want to summarize for astrobites, providing a sample framework to mold into your own approaches. Abstract: A summary or statement of the contents of a book, article, or formal speech (my MacBook dictionary). A perfect place to start! If you are an undergrad deciding whether an article is worth your time to delve into, reading the abstract is the quickest way to get the gist of the paper. The abstract usually provides a sentence or two introduction/motivation for the study, a description of methods (observations/simulations/software), a summary of the results, and a sentence or two on the implications of the findings. When sifting through arxiv the morning before my biweekly astrobite, I usually stumble upon a handful of paper titles that catch my attention. I immediately read the abstracts to decide a) Is it really as interesting to me as the title suggests and b) If the abstract is well written and digestible, chances are the article will be interesting as well. The introduction of a paper should provide the reader with a background or history of the research topic and a clear motivation for why this particular study has been conducted in relation to current and previous studies. In many papers, this section includes a superabundance of references to previous work which, for the casual reader, is good to keep and eye on. References can help put the study in context if you recognize some of the referenced works. Now I have a good idea why the authors wanted to do the work that went into this article. This is where I begin to read out of order. After reading the introduction my immediate question is, “So did they answer the questions posed in the introduction?” The discussion section is where the authors will present interpretations of their results and summarize them in more detail than given in the abstract. Most of the time, this is also where the authors talk about any future work they plan on performing to follow up on their findings or discuss ways to improve the results with new instruments, faster computers, or a larger observational sample. Simultaneously, while reading through the discussion, I am flipping to whatever plots, correlations, or fits the authors are describing to get a visual representation of their main results. At this point, I either want to continue reading the results and methods sections to understand the main points well enough to write a summary, or I store the takeaway message in my noggin and move on to another article (or the grad lounge for some caffeine). If I decide to read on, the Methods section is always the last place I get to. Unless the aim of the paper is to describe a groundbreaking new technique and how it affects their results, reading about the length of their exposure on an instrument or resolution of their grid in a simulation can wait until after I get a handle on what the authors have found. This is the way I approach a paper on an unfamiliar topic and is not the only way to do it. A past professor of mine once told me that after the abstract she heads straight for the figures and captions. Some people don’t feel comfortable unless they read it straight through soaking in information one section at a time (I approach articles more pertinent to my own research this way). Articles can be very short < three pages, or very long > 30 pages. If you are just perusing the current literature, having a strategy to understand the main points of that “I can’t put a staple through this” paper without reading the entire thing is useful. The only straight advice I feel comfortable giving is to not get discouraged when tackling your first papers. Even well written papers take a certain level of knowledge in the field, and as an undergrad, you simply might not have had that level of classes in your major yet. If you read an abstract that interests you, but find the article frustrating, ask a grad student or your advisor in the department about parts that confuse you. Identifying the main points of a journal article simply takes practice, and if you are doing research, you will get plenty of that! To start, read articles on topics you know something about already, and as always, use astrobites to your advantage. For practice, read an article that we have reviewed. Remember, you can always find new articles posted on arxiv and search for articles on the ADS website. And with that… Happy Highlighting! One further tip that’s helped me: read a paper with a friend! It’s the idea behind journal clubs, right? But it’s do-able on a small scale, as well — just find a friend to read the same paper, and then discuss it when you’re through. You’ll each have a different perspective of the paper, and discussing it almost always makes it easier to tease out the intended meaning. I think this is how most astronomers seem to go through articles: Abstract, Intro, Discussion/Conclusions, Captions/Figures, the whole shebang. My only addition is that if do plan to read an article fully, I’ll go through it once and let the ideas simmer so that I can formulate questions about the work. Then, on a second, more thorough pass, and can watch out for answers to those questions. I also think it’s also important for people who write articles to keep the standard modus operandi in mind. For example, make sure that your abstract contains your main findings and quantifies them, if that’s what you’ve done. It might be the only part people read! Similarly, I think it helps for a caption to say why the figure is interesting, not just what it contains. The reader might not bother going through the text. I find the Abstract the most difficult part of the paper. I have to read, and re-read the sentences in the Abstract carefully, as they are a summary and often packed with information. I follow Dr. Julio Soto’s (Biology professor at San Jose State University) advice on how to read papers, which is very similar to the process outlined in the article, except, after reading the Introduction, I continue looking through the pages, looking at the figures, thinking about what they represent, reading the captions, and then going to Discussion, and then going through Methods/Data/Results etc. I end up re-reading the papers many times if needed, and accompany my reading with note-taking, such as which papers are quoted about this or that interesting point, or to jot down any ideas that I have while reading the paper (before they evaporate from my head). Oh yeah, and also, I find that it is helpful for me to look up the authors and their institutions and research pages/cvs to see if they are part of a big group, or just to get inspired or to get to know the authors and their astronomy career paths. That human aspect makes the paper a little less “intimidating”.